D line is not as good as it seemed although I do expect them to be a strength at times. O line was suspect for sure. Hope McCullough starts he’s a beast in the secondary. Ha, I like to keep tabs on the dummies. Thought Maurer looked really good. Needs 25-30lbs though. Who are the 2 starters missing? Kennedy and who else, if you think Kennedy will start. And no, I don’t think Smith is or should come back. Wright but trusting a true freshman makes me nervous, especially one who missed Spring ball. In my opinion we have nothing to hide from the competition. Everyone realizes it is what it is. All we can do is take advantage of every opportunity we have to practice and get reps. It’s all about getting more reps and actively working to get better with each rep. Hence the 1’s vs the 1’s. I thought they looked like an SEC team size wise for the first time in a while. That’s a step for sure. O-Line.. trying to compete in the SEC with 2 high school kids ...??? Gonna be a long year AGAIN for J G, and anyone else who steps in that “knocking box” laughingly being referred to as a “ pocket”. I’m hearing and seeing all the right things for the FUTURE and remain committed to CJP and the future of Big Orange Football but anyone thinking 2019 is THE year the VOLS are back will be disappointed. Bingo. 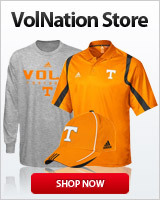 No SEC team is paying any attention to Tennessee, nor should they....not Alabama, not Florida, not Vandy. And we shouldn’t care. We’re so far behind that we’ve got to practice everything, put it all in the table and work towards becoming a good SEC team. Once we’re there, once we’re competitive again and become a potential threat to any other SEC team, then we can talk about competitive advantages and not showing our hand. Until then, all bets are off. Work on what you have to work whether it be in a closed practice or during a televised spring game. Ok it take a while for olines to gel and start to pick up blitzes. I thought the oline was consistently average except for the right side was somewhat below average. Run blocking was good pass blocking was average. I think there will be a shuffle in the off-season so I’m not too concerned with the oline. The guys looked way better than last year. Proper first steps, Double teams, picked up stunts consistently what more can u ask for in the spring? The dline was what concerned me the most. Once the offense settled there was no pressure at all up the middle. Many time the nt couldn’t command a double team in running situations. In the 4th the ones and the twos looked almost identical which tells me that we don’t have enough body. Overall the d looked slow. The front seven needs work. Secondary was pretty good all day. Lets just call it what it is, our team is still not good. Both lines are still well below average fir the SEC. There is no quality depth on either line. Having said that, we should see some improvement on both lines. There is absolutely no excuse for TN not to have an OL and DL comparable to Vandy, UK and Mizzou this year. Hell, Mauer won’t ever really play because we can’t keep JG on the bench. Why would you want the worse QB to play? Out of curiosity, what did you think of Shrout and Maurer yesterday? Both looked ok. I think Maurer just needs some time. Shrout showed some flashes. Neither really showed anything special imo. I am excited about our QB play in the future. Hopefully Shrout, Maurer and Bailey will not have to go through anything like JG has.